CueBlocks presents a great tool to automatically track all the outbound links on your website using Google Analytics. All you need to do is enter your Google Analytics details and the tool will generate a script for you. This script will automatically track all the outbound links on the page as events in Google Analytics. Tracking the affiliates from a website. Knowing why users left your website, did they go to another link that you provided (which means that they read your content), or they left because they did not find the website interesting enough. Tracking the amount of users that go to other domains/pages of yours from your website, such as your Facebook or LinkedIn profile page. Certain websites are specifically created to send traffic to other websites and then subsequently paid for the amount of traffic sent. Here, it becomes very important to track outbound links and measure the amount of visitors actually sent. Tracking outbound links in Analytics can be done using Event Tracking. However, this method is manual, which requires a code to be pasted on each page and with each link. This is easy for a website with a few outbound links, but is not feasible for a website which has a lot of outbound links. This is where this automatic outbound link tracking tool comes in. Using this tool, you can track your outbound links automatically. All you need to do is simply add your tracking ID and you will get the tracking code. The best part about this tool is that it does all the work for you. You will not need to add any tags on your website. Just the script needs to be added, which will track all the outbound links. Click here to go to the Automatic Outbound Link Tracking Tool. You will have to install two codes. The Google analytics tracking code and the code that tracks outbound links. With this tool you will get both the codes, i.e. the Google analytics tracking code and the outbound link tracking code that you will have to paste on each page of your website. If you already have Google analytics code on your website, then remove that code and paste the code that will be generated for you via this tool. Once you have successfully put this code on all the pages of your website, you will get the statistics in the “Events” Section of your Analytics account. Please note that once you have installed the code on all the pages of your website, it will take some time (a few hours) for the statistics to start showing in your Analytics account. 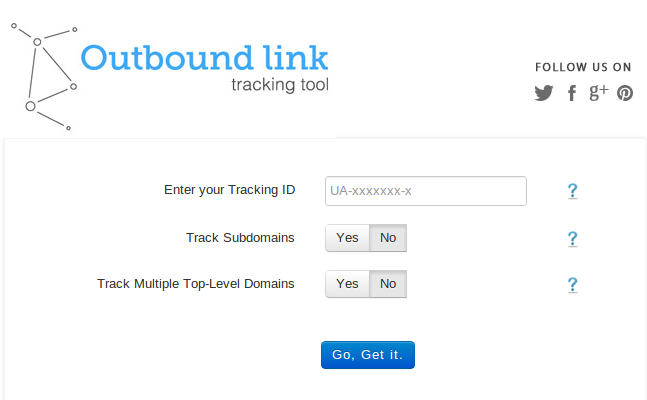 this looks like the perfect tool for automated outbound link tracking. Does your team develop an update for the new Universal Analytics tracking code? Will it work with the anonymizeIP function? We will be launching the Automatic Outbound Link Tracking Tool for Universal Analytics shortly. Sorry, this tool does not work with the anonymizeIP function. Watch this blog for updates regarding Universal Analytics. Hi there, Thanks for the tool. I have a confusion while integrating this into my website. Do I need to add any code for the link ( tag) or need to just put the code generated by the tool. The Automatic Outbound Link Tracking Tool works with the classic Google Analytics Code (ga.js). You do not need to put any code for the tags. Just place this code and your outbound links will get tracked automatically. Hi there, Thanks for the tool. I have a confusion. Do I need to add any code for the tag or the link which is going to redirect user to the another page? Or need to just put the code generated by the tool? Hi Nosheen. Thanks for this great tool! I tried adding it to my website but have not seen any events being tracked thus far. If you have a chance would you be able to check out http://www.coolrunning.com/engine/2/ to see what the problem might be? I have inserted code on all outbound links works perfectly in Google analytics full reports available on all clicks . Glad we could help you out. Let us know if you need any assistance anytime. This tool could be very great since it automatically generates and the standard code for Analytics as well as the code outbound link tracking. However only the basic Analytics tracking works but not the event tracking. I have the same problem as Jason mentioned earlier. It says that an X number of visits send events but no data shows up. I also waited days to check if the data comes in later, but nothing happens. Could it maybe be a bug in the code? Thank you for using our tool and we apologize for the inconvenience caused. Could you please give us the link of the page/pages where you are using the code so that our developers can check it for any issue. I have the code installed. Analytics shows 6 of my visits sent events but no other data. What did I do wrong? to appear under top events and the pages reports. and the screenshot of the events section of your Google analytics interface. Does the code generated by your tool need to be one Every page of the site or just the pages with the outbound links you want to track? If you already have the Google Analytics code on your entire website, you can add our code only on those pages on which you want to track the outbound links. For this, you can replace the existing GA code on them with the code generated by this tool.